While browsing through our photographs, I found a serendipitous connection between our recent Women in Science portraits and our present focus on astronomy and photography. 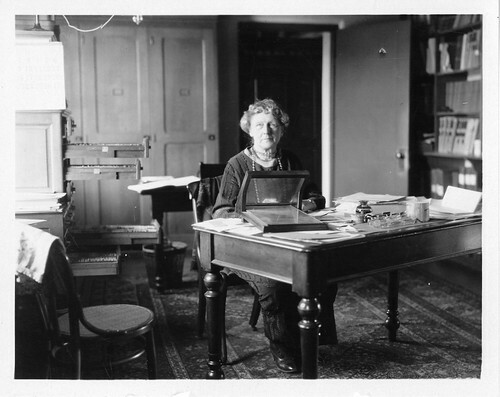 Annie Jump Cannon, one of the women featured in that set, began her tenure at Harvard College Observatory as one of the many female "computers" under Observatory director, Edward Pickering. These computers, sometimes called "Pickering’s Women," were hired to do the tedious scanning and measuring of astronomical photographic plates and the resulting calculations on the positions and brightness of stars. Pickering could hire female computers as unpaid volunteers or for a fraction of the price of men, and he observed that the women he hired (including his housekeeper) were actually more capable of the laborious and detail-oriented work than many of the male scientists. Most women during this time period didn’t have university-level science educations and so they tended to be able to contribute the most in data-gathering and sciences that didn’t require specific educational training, such as botany and astronomy. In particular, the shift in the late-19th and early-20th centuries from observational astronomy to the new field of photographic astrophysics allowed women to become some of the most important astronomers of their time. Annie Jump Cannon systematically categorized the hundreds of thousands of stars shown on the photo plates taken at the Observatory to create her own special classification system, which is still in use today. 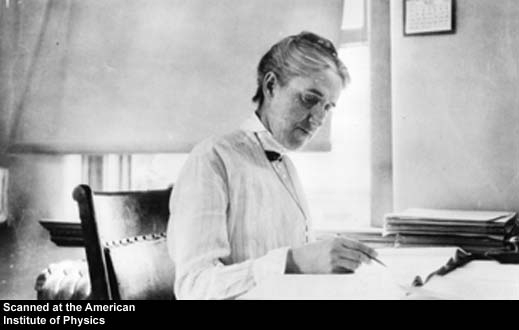 Cannon’s colleague, Henrietta Leavitt, devised a theory that helped to discovered the period-luminosity law for Cepheids, on which basis astronomers still measure the size of the cosmos, and discovered 2,400 variable stars—about half of the total number of variable stars known at that time! Though they received almost no recognition during their lifetime, "Pickering’s Women" succeeded in far surpassing most of their male counterparts in their discoveries through astronomy and photography. As Bill Bryson notes in his book, A Short History of Nearly Everything: "(Just to put these insights into perspective, it is perhaps worth noting that at the time Leavitt and Cannon were inferring fundamental properties of the cosmos from dim smudges on photographic plates, the Harvard astronomer William H. Pickering*, who could of course peer into a first-class telescope as often as he wanted, was developing his seminal theory that dark patches on the Moon were caused by swarms of seasonally migrating insects.)" For more information and references, see Science in the early twentieth century: An Encyclopedia (pg. 249), by Jacob Darwin Hamblin. *William was the younger brother of Edward Pickering, the Harvard Observatory director.